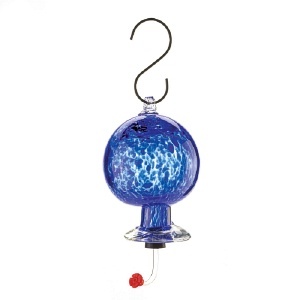 This stunning feeder crafted from hand blown glass in shades of blue ensures beautiful little hummingbirds will never forget to visit your yard. Forget-Me-Not inspired, gaze and delight in the delicate buzzing of hummingbirds as they sip from this feeder. Blue patterned glass with loop at top for hanging and plastic stopper and feeding nozzle. Due to the unique hand blown nature of this piece, color and design may vary.